One of the best hotel in Mandalay, located at the foot of Mandalay Hill and facing the Royal Palace, each and every of the 206 rooms and suites commands stunning views. Mandalay Hill matches the exquisite surroundings, both inside and out. The boutique-style hotel is a cerebration of all things Myanmar, featuring teak furniture and fixtures & fittings made from ratton, mother-of-pearl and other local materials as well as Myanmar marble lining the bath room walls. Rupar Mandalar is a romantic hotel in exotic atmosphere. A modern facilities and sight full of swimming pool large tennis court, health and beauty spa. Nestled in the heart of Mandalay city, Sedona Hotel Mandalay is an oasis of calm and tranquility set amidst four acres of landscaped gardens. The hotel has unbridled views of the Mandalay’s most famous attractions. Located in the heart of the Mandalay’s main business and historical district. Delivering Myanmar’s unique and courteous hospitality, this elegant upscale hotel will delight both business and leisure travelers with spacious accommodation, a broad array of leisure facilities, extensive meeting space and international dinning choices. 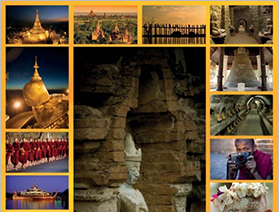 Eastern Palace Hotel is the ideal choice for all travelers to Mandalay. coined as “the silent zone” for its peaceful setting and quiet neighborhood. Situated in the Heart of the City (near Mandalay Railway Station,Yadanarbon Super Market, Diamond Plaza Shopping Malls and Mandalay General Hospital). 5 minutes drive to “Zegyo” Market and Night Bazaar. 10 minutes drive to major tourist attraction places such as Mandalay Royal Palace, Mandalay Hill, Golden Palace Monastery and Mahamuni Pagoda.